A house explosion in Breckinridge County killed one person and injured two more. 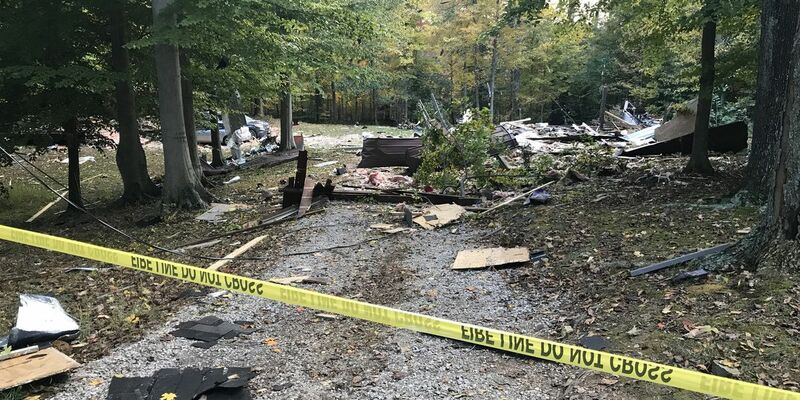 The aftermath of a home explosion in Breckinridge Co.
BRECKINRIDGE COUNTY, KY (WAVE) – One person is dead and two people are in critical condition after a home exploded, according to Breckinridge County dispatchers. The explosion was reported off of Laurel Branch Road around 10:25 a.m. CT on Saturday. WAVE 3 News has learned that the house was on Camp Green Shores Road. The two people critically injured have been identified as Joshua Lucas, 29, and Timothy Randall, 56. They were taken to University Hospital in Louisville. The woman killed was identified as Loretta Harris, 62, or Burnside, Ky. The Kentucky State Police said the preliminary investigation points to a possible gas leak. No foul play is suspected. “It felt like a bomb went off,” said next-door neighbor, Larry Tucker. That’s what you might think at first glance. Where a house once stood, now scattered across three acres and beyond. Neighbors reported hearing the explosion 10 to 15 miles away and neighbors up to five miles away were feeling it actually shake their homes. Some even had debris fly into their yards. All the surrounding homes have damage like windows blown out and doors blown in, including Tucker’s. A former member of McDaniel Fire Department, Tucker says once a firefighter always a firefighter. That’s why he chose to run into his next door neighbor’s fiery home. Tucker said he and another neighbor James Riggs got the first man out who told them the house was filled with ammo, but that didn’t stop them. Along with the woman, Tucker says a service dog also was lost to the flames. The previous owner of the house told us he sold the property to a young disabled veteran. As to what caused such a forceful explosion, many neighbors and the previous owner believe it was the propane tank.